The former president is leaving no stone unturned in his bid to become prime minister. On August 17, Sri Lanka will go to the polls to elect a new parliament. While the electoral contest is primarily between the Sri Lanka Freedom Party (SLFP)-led United People’s Freedom Alliance (UPFA) and the United National Party (UNP)-led United National Front for Good Governance (UNFGG), it is former president Mahinda Rajapaksa’s bid to return to power as prime minister that has hogged the media spotlight. Seven months ago Rajapaksa lost his quest for a third successive term as president when his former health minister, Maithripala Sirisena defeated him in the presidential election. Rajapaksa’s ouster was widely described as the end of the Rajapaksa era in Sri Lankan politics. In fact, that era may not be quite finished yet – Rajapaksa is eyeing a comeback as prime minister. His reasons for doing so are not hard to fathom. Rajapaksa and his family benefited enormously during his presidency. As Paikiasothy Saravanamuttu, the founder executive-director of the Colombo-based Centre for Policy Alternatives (CPA) told The Diplomat in the run-up to the January presidential election, “Staying in power is literally and metaphorically a matter of life and death for the Rajapaksas,” noting that it protected them from prosecution for war crimes, corruption, and other alleged misdeeds. Lionized by the Sinhalese-Buddhist nationalists for defeating the Liberation Tigers of Tamil Eelam (LTTE) in May 2009 and ending the decades-old civil war, Rajapaksa performed well in Sinhalese constituencies in the presidential election. “He still enjoys overwhelming support in the Sinhala-Buddhist heartland where this election’s outcome will be decided,” Lasanda Kurukulasuriya, a Colombo-based political commentator told The Diplomat. A recent pre-election survey conducted by the CPA revealed that Rajapaksa has an edge over Prime Minister and UNP chief Ranil Wickremesinghe in the Sinhalese constituencies. It is to benefit from the support Rajapaksa enjoys among Sinhalese-Buddhists that SLFP leaders pressured Sirisena, who also heads the SLFP and the UPFA, to allow Rajapaksa to contest the parliamentary election under the SLFP banner. His candidature could be ignored only at the peril of the SLFP, they argued. Although Sirisena took over the leadership of the SLFP and the UPFA from Rajapaksa following the latter’s ouster, the former president’s influence in the party remains strong. Rajapaksa is leaving no stone unturned to ensure he returns to power. A carefully orchestrated “Bring back Rajapaksa” campaign involving rallies and processions was set in motion within a month of his ouster from the presidency, creating the impression that the masses wanted him back in active politics. Clearly, Rajapaksa aims to return to power on Sinhalese nationalist votes; hence his raising of issues that resonate with them. Themes like “patriotism,” “threats to national sovereignty” and the “need for a strong state” figure frequently in his campaign speeches. The bogey of a revival of the LTTE is being raised to stir Sinhalese insecurities. So will the upcoming election see the UPFA form the government? Importantly, will Rajapaksa return to power as prime minister? “Highly unlikely,” says S I Keethaponcalan, Chair of the Conflict Resolution Department, Salisbury University, Maryland. Unlike in the presidential election when Rajapaksa “did not hesitate to use state resources for electoral/political purposes,” the lack of access to such resources this time around will have a “negative impact” on his comeback bid, he explained to The Diplomat. Although Rajapaksa remains popular among Sinhalese-Buddhist voters, the Rajapaksa-Sirisena hostility – the two have been likened to a cobra and a mongoose – has “discouraged” some SLFP voters, Keethaponcalan observes. The SLFP is a divided house and this could cost it votes. Unlikely to win enough seats to form a government on its own, the UPFA will need outside support. But small parties, such as the Tamil National Alliance (TNA), the Janata Vimukti Peramuna (JVP), and the Democratic Party, which together could win about 20-25 seats “will not directly or indirectly support Rajapaksa,” Keethaponcalan points out. These parties are strongly opposed to Rajapaksa. Even if the UPFA wins enough seats to form a government, Sirisena could block Rajapaksa’s path to the prime minister’s post. According to Article 43(3) of the Sri Lankan Constitution, “the President shall appoint as Prime Minister the Member of Parliament who in his opinion is most likely to command the confidence of Parliament.” It is the president who appoints the prime minister. In a statement on July 14, Sirisena not only underscored his animosity to Rajapaksa but also, he clarified that even if the UPFA wins the election, he would not appoint him as prime minister. 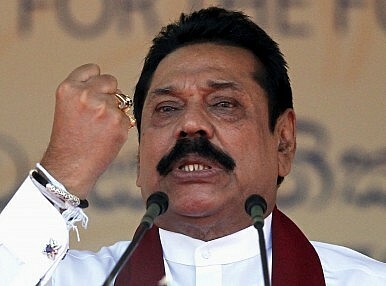 “There are enough seniors to be appointed as the prime minister, instead of Mr. Mahinda Rajapaksa,” he said. In the circumstances, there is “very little chance” of Rajapaksa becoming Sri Lanka’s next prime minister, says Keethaponcalan. Recent news of an investigation into a murder allegedly linked to the Rajapaksa regime will not help. With voting day now just days away, the UNFGG seems to be at an advantage. Over the last six months, the UNP-led minority government has been successful in bringing down prices of essential commodities and in restoring freedoms, which is likely to translate into votes. Several factors favor the UNP’s chances of forming a government. The first is that it is likely to win the “most number of seats, which will allow it to form the government,” Keethaponcalan observes. Besides, the president “prefers Wickremsinghe” to Rajapaksa, raising the chances of the former being invited to be the next prime minister. Finally, unlike Rajapaksa, Wickremesinghe enjoys support among the Tamils and Muslims. The CPA survey reveals that 62 percent of Tamils, 71.1 percent of Up Country Tamils and 62.3 percent of Muslims support Wickremesinghe as prime minister while fewer than 2 percent in each of these communities prefer Rajapaksa for this post. Although the TNA and the Sri Lanka Muslim Congress (SLMC) are not part of the UNFGG, these parties can be expected to extend support to the UNP should it fall short of a majority. This is something that a Rajapaksa-led government cannot expect under any circumstances, given the antipathy that Tamils and Muslims have towards the former president. In the presidential election, parties with little in common came together to form a “rainbow coalition” to oust Rajapaksa from power. His entry into the electoral fray now as a candidate of the SLFP has once again triggered a churning in Sir Lankan electoral politics, turning allies into antagonists and former foes into bedfellows. Liberal Sri Lankans and civil society activists fear that the political and electoral reform process set in motion by Sirisena and the UNP-led government will be jeopardized should Rajapaksa return. But there is also concern over whether a motley alliance that has nothing in common but opposition to Rajapaksa will be able to hold together and rule if it comes to power. Should Rajapaksa succeed in becoming Sri Lanka’s next prime minister, he will have more powers than his predecessors. Ironically, it was the efforts of his nemesis Sirisena and the UNP government that culminated in constitutional reforms in April that enhanced some of the powers of the post.